Brought this sweet, salty, spicy snack to a punch party last weekend. PunchPartySayWhaaa? Ya. PUNCH PARTY. A party where a very generous, very fun cocktail-minded couple serves several authentic, throw-back, boozy bowls of punch- fancy little punch cups and all. God love ’em for doing it. I needed a quick recipe and wanted to use what I had in the cupboards. Hmm, can of pumpkin purée? Not exactly a crowd-pleaser…. Cat food? Better not…… Box of arborio rice? Too crunchy…. AHA! Popcorn kernels! Et voilà- a star was born. A thrifty, 5-minute party snack hit for the ages. The punch party patrons partook with pleasure. Please, prepare your own personal pot (insert When Harry Met Sally paprikash joke below). This recipe moves quickly, so set yourself up first. 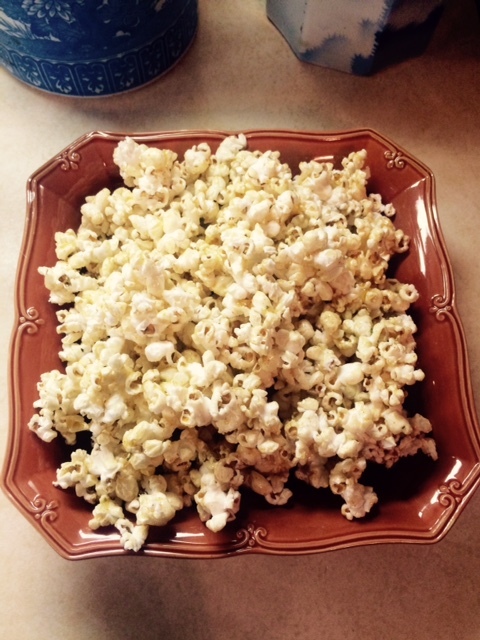 Grab a small saucepan for the glaze and a wide, lidded one for popping the popcorn. Ready a large bowl and a spatula for glazing the popcorn and line a large cookie sheet with parchment paper to turn the finished product onto. In the wide pan, heat the tablespoon of canola oil over medium-high heat. When the oil is hot, add the popcorn kernels and shake the pan around like a madman/woman until all kernels are popped. This will happen fast- about a minute thirty or so. Shake, shake, shake until the popping slows down. Remove the pan from heat and dump into the large bowl. On to the glaze! Add all remaining ingredients to the small saucepan and bring to a gentle boil over medium, stirring constantly. Boil for about a minute, then remove from heat to cool for another minute. Cut to tomorrow (ooh! time travel)! : I highly suggest nursing your next-day case of the zings with a jazz brunch, a proper bloody Mary, and a trip to your local art museum. Worked for me, but it was also 63 degrees outside- in December. Just the way I like it! Aformentioned WHMS joke, as promised. Oh, Nora. 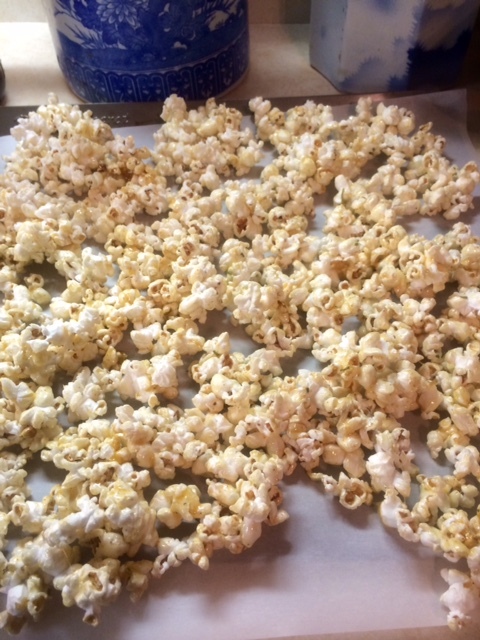 This entry was posted in Classics, Easy, Fancy, Fast, Gluten free, Holiday, Quickie, Snack, Uncategorized and tagged easy holiday appetizer, easy holiday popcorn, festive popcorn, glazed popcorn, holiday popcorn, maple glazed popcorn, party popcorn, popcorn appetizer recipe, popcorn recipe, spicy sweet popcorn, unpopped pocorn recipe. Bookmark the permalink. Awesome!! It is sooo good!